The unit is made of fairly cheap plastic and has less than durable connection points. It works really well, is fairly easy to use, and has highly advanced functions. There are a couple of minor issues, but high overall user friendliness. This is a review of the ANCEL FX6000, which is a highly advanced and functional coding and programming tool for automobiles. This item functions in multiple languages, plus it can be used for over 40 different car brands worldwide. Whether Asian, European, or North American cars, as long as they were built in 1992 or after, the ANCEL FX6000 will be able to diagnose issues, resolve error codes, and more. It doesn’t need any batteries or extra software or hardware. Simply plug it into the 16-pin port on your car and this scanner is good to go. The ANCEL FX6000 is a scanner and fully functional automotive code reader. 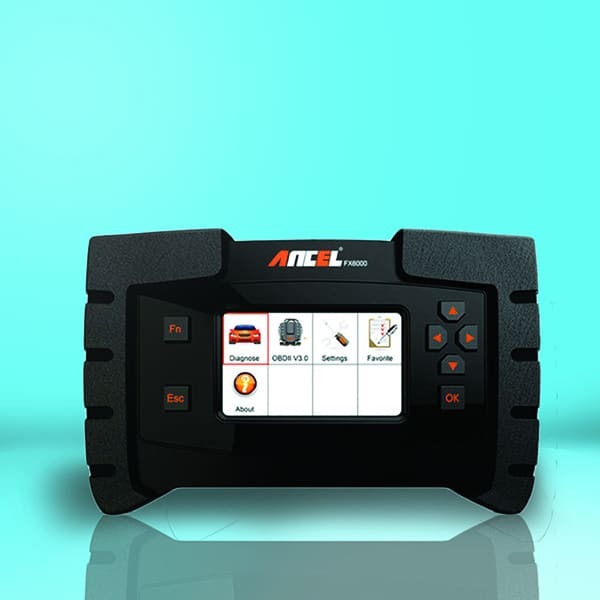 If you need an scanner to read and diagnose automotive codes, and for advanced ECU coding and programming, the ANCEL FX6000 might be a good option for you. With this scanner, you will get 2 years of free online upgrades, which is more than can be said for most other scanners. The fact of the matter is that while this ANCEL FX6000 scanner is quite expensive, more so than most other standard models, it also has a lot of features and functions that make this model well worth the investment. It might not be the easiest to use car scanner in the world, but once you get the hang of it, it certainly gets the job done. If you are a vehicle technician or just like to fix problems with your car by yourself, the ANCEL FX6000 could be a good investment for you. If you need to reprogram certain electronic functions in your vehicle, or if you need to read, reset, and fix error codes, this scanner can get it done. As long as you speak one of the nine languages which this model functions in, and have one of the many vehicles which it covers, it’s a scanner that could be right for you. As long as the car is Asian, European, or North American, and built between 1992 and 2017, the ANCEL FX6000 will most likely work for you. When you buy the ANCEL FX6000, you get the console itself, which is a fairly large handheld display and control panel, one with a big high definition TFT display that is easy to read. You also get the diagnostics cable, the OBDII connecter, a Citroen-16C connecter, a USB cable, and a carrying case, plus a user’s manual too. What is nice is that it comes with a USB cable so if necessary, you can transfer the data over to your computer and examine it there. The ANCEL FX6000 scanner has a whole lot of features that are worth talking about. For one, this tool can be used to diagnose your engine system in many ways. It displays live vehicle sensor data in either text or graph format. It also performs O2 sensor tests, component tests, and can read and clear all kinds of codes associated with the engine. On that same note, the ANCEL FX6000 can also be used to reset the oil light and service light too. Furthermore, the ANCEL FX6000 can also read and clear many other codes including ABS, TPMS, DPF, EPB, SAS, and several others. This scanner can also be used to read and reset codes concerning the SRS airbag system. Furthermore, the ANCEL FX6000 also works for all kinds of error codes and diagnostics in regards to the transmission system of your vehicle. Of course, by far one of the best features here is that the ANCEL FX6000 features highly advanced ECU coding and programming; this is not something that can be said for very many aftermarket automotive diagnostics tools. 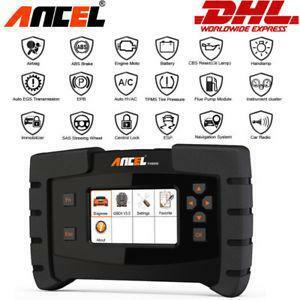 There are so many other things that the ANCEL FX6000 can do, including reading error codes associated with the battery system, the AC, the body system, the chassis, central locks, car radio systems, the headlamps, and so much more. Whatever the case may be, the ANCEL FX6000 can read all kinds of error codes and allows you to reprogram a large variety of functions. It’s a nifty little tool that doesn’t need batteries, can be plugged right into your vehicle, and also allows you to transfer the data over to your computer. As you can see, the ANCEL FX6000 scanner is a highly advanced programming, coding, and diagnostics tool for all kinds of cars. It can read and solve pretty much any error codes your vehicle might be having, plus it allows for advancing coding and programming like no other option on the market. It might be a bit pricey, but it will quickly give you your money’s worth.